Dimensions: 6 x 8 in. 96 pages. 24 color images/photographs. Hardcover. With little fuss and enormous flavor, transform everyday meals with simple yet creative toppings, dips, and spreads.Forty recipes are paired with multiple serving suggestions for producing yummy (and healthy!) dishes, from appetizers to dinners. With few steps to follow and minimal ingredients to purchase, these recipes—many of which are sensitive to vegans and those with nut and gluten allergies—are built for speed and ease. Fifteen minutes is the total preparation time for Classic Provençal Tapenade, Balsamic Fig and Caramelized Onion Spread, and Rich Crab Spread. 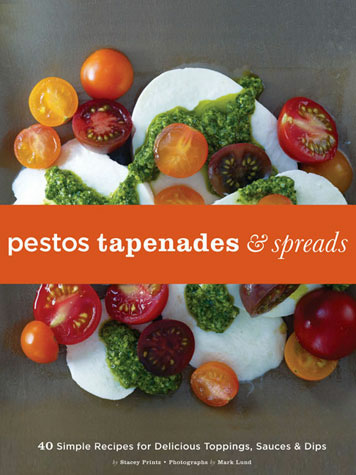 Using fresh ingredients and pantry staples, you'll soon be whipping up tasty pesto faster than you can say "presto!"